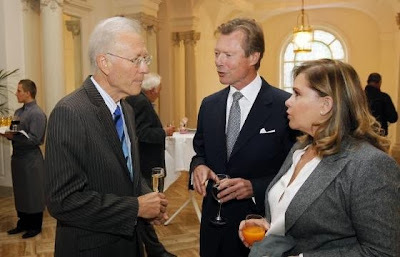 Archduchess Marie-Christine, oldest child of Princess Marie-Astrid and Archduke Carl-Christian of Austria, and her husband Count Rodolphe de Limburg-Stirum recently had their second baby, a boy named Constantin. The little brother for Count Léopold was born on October 25 in Anderlecht, Belgium. Archduchess Marie-Christine and Count Rodolphe seem to have moved back from Argentina to Belgium a while ago. Little Constantin is the fourth great-grandson for Grand Duke Jean joining his older brother and princes Gabriel and Noah, sons of Prince Louis. Another great-grandchild for Luxembourg's former head of state is due to be born next month. In always yawn-worthy news of any royal news blog, Hereditary Prince Alois received new four new ambassadors to Liechtenstein; Charalambos-Gerassimos Manessis of Greece, Antonio Gustavo Trombetta of Argentina, Peter Howard Rider of New Zealand and Franc Miksa of Slovenia presented presented their credentials over the the Principality's acting head of state today. Also in not socks knocking off news, Grand Duke Henri, Grand Duchess Maria Teresa and Hereditary Grand Duke Guillaume attended an annual gala dinner of the Euro-Toques Luxembourg, a union of star chefs trying to preserve the European culinary heritage, last night. A few pictures are available at Wort. Not really exciting either but worth a mention, on Friday the Fürstengruft, the burial place of the Princely Family, will be open to the general public like every year on All Saints' Day. Between 1pm and 4pm, everyone will be able to view the crypt near the St Florin cathedral in Vaduz that has been the last resting place for about 30 members of the Princely Family since around the end of World War II. 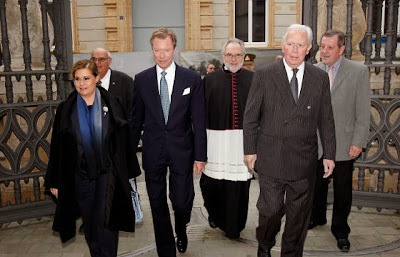 On a similar note, Grand Duke Henri, Grand Duchess Maria Teresa, Archduchess Marie-Astrid and Prince Jean will be attending a mass for the deceased members of the Grand Ducal Family on Saturday which is All Souls' Day. 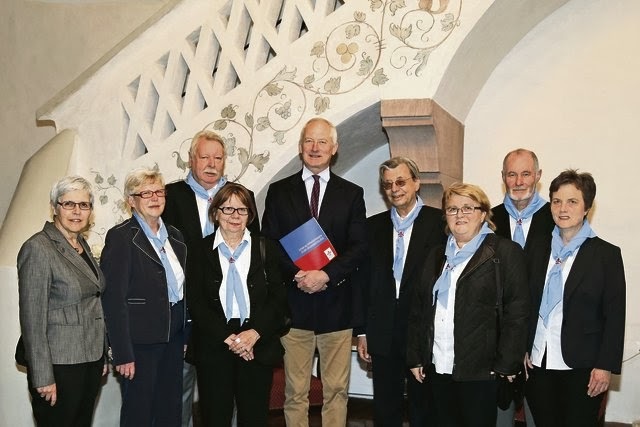 Yesterday, Prince Hans-Adam II received members of the Pfadfindergilde Liechtenstein, which seems to be the umbrella organisation of the country's scouts or something along those lines, at Schloss Vaduz. During the audience, he was given a picture book on the occasion of their jubilee. The foreword of the book was written by Prince Hans-Adam and it also includes pictures of him as a young scout. Already on Friday, the Prince's wife, Princess Marie, welcomed the superior convent of Einsiedeln Abbey at the Schloss. 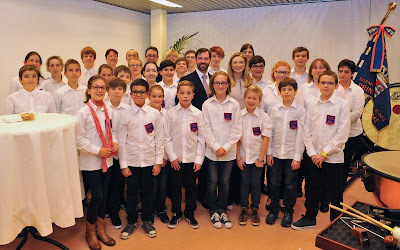 Already on Friday night, Hereditary Grand Duke Guillaume and Hereditary Grand Duchess Stéphanie attended an academic session organised on the occasion of the 25th anniversary of the Harmonie des Jeunes Prince Guillaume, the youth orchestra of the Fanfare Royale Grand-Ducale. Without any visual evidence as of yet, the Hereditary Grand Ducal Couple were also present for a concert by the Orchestre de Chambre du Luxembourg given on the occasion of their first wedding anniversary. The benefits of the concert which included music by Wolfgang Amadeus Mozart, Pyotr Tchaikovsky and Felix Mendelssohn went to the 'A hand for the sick' initiative of the Luxembourgish Red Cross. Here you go for a picture. New Princess Claire and Prince Félix will be visiting Japan on November 1 to participate in the celebrations of the 100th anniversary of the Sophia University in Tokyo. After a religious service at the St. Ignatius' church in Tokyo, the couple will attend an official ceremonial act to celebrate the anniversary taking place in the presence of the Emperor and Empress of Japan. In the evening, Prince Félix and Princess Claire will meet with Luxembourgers living in Japan at a reception hosted by the Luxembourgish embassy. The University of Luxembourg and the Sophia University are partner universities. Another guest from the Grand Duchy at the celebrations will be Archbishop Jean-Claude Hollerich, who was a professor of German and French and vice-rector of the Sophia University before becoming the head of Archdiocese of Luxembourg. Currently, there are two Luxembourgish Jesuit priests working as professors at the Japanese Catholic university. Today about 2,700 students of the Grand Duchy participated in a charity run to raise funds for HIV/AIDS research as well as the AIDS counselling of the Luxembourgish Red Cross. The 20th edition of the event was organised by the Lycée classique de Diekrich and took place during the course of the whole day at the Mersch campus of the secondary school. 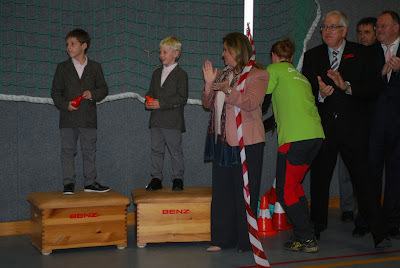 Grand Duchess Maria Teresa, who has been committed to the fight against AIDS for many years now, as well as her grandsons Prince Gabriel and Prince Noah visited the running students this morning. Judging from the pictures -- Check them out at L'essentiel in German, on the website of the cour grand-ducale and on the website of the Lycée classique de Diekrich -- it looks as if, at least, Noah also ran a few rounds to raise money for a good cause. RTL has a video of the event. Today, Grand Duke Henri welcomed Xavier Bettel, mayor of Luxembourg and leader of the liberal Democratic Party (DP), for yet another audience at the palais. In his capacity as head of state, the Grand Duke appointed Mr Bettel as the formateur which means that he is in charge of forming a new government. He is expected to form a coalition with the socialist LSAP and the Green party. During their meeting, Mr Bettel and Grand Duke Henri also talked about the political, economic and social situation of the country. 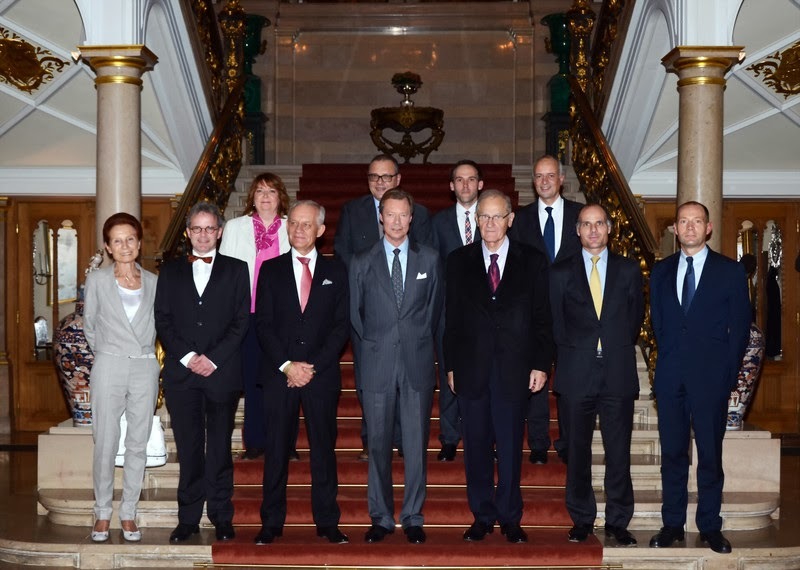 After the meeting with Luxembourg's future prime minister, the Grand Duke also held an audience with a delegation of participants of a meeting of the the Council of the Notariats of the European Union (CNUE) which is currently taking place in the Grand Duchy. Prince Gabriel and Prince Noah, the not-so-small-anymore sons of Prince Louis and Princess Tessy, visited Disneyland Paris with their Boma, Grand Duchess Maria Teresa, seemingly today. 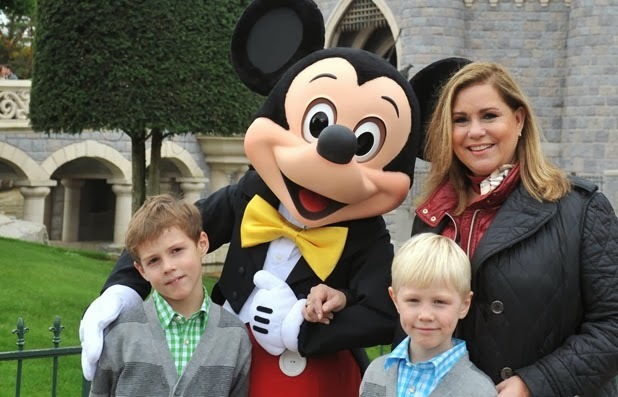 Have a look at the Facebook site of the awesome Royalement Blog to see another picture of the Luxembourgish trio and Mickey posing in front of the Château de la Belle au Bois Dormant, the resort's icon. 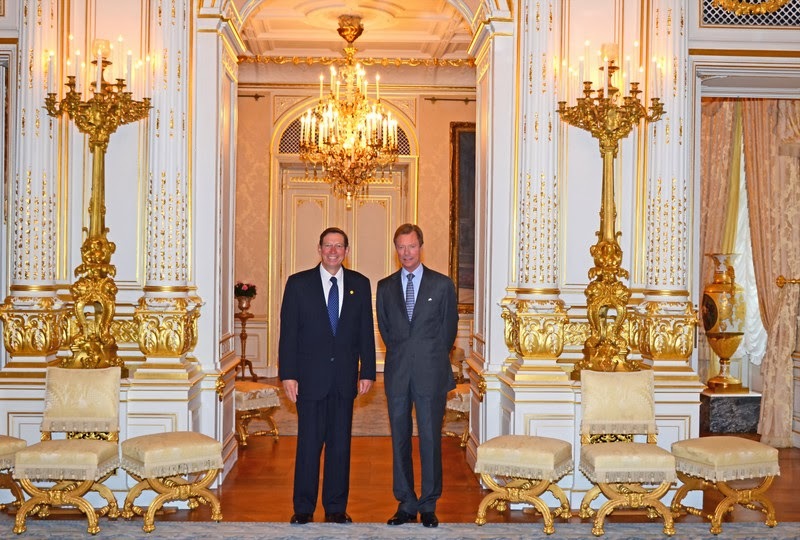 Also in less exciting/cute news though more important in the bigger picture, Grand Duke Henri has met with informateur Georges Ravarani today and has now invited Xavier Bettel, mayor of Luxembourg and possible new prime minister, for an audience tomorrow. Hereditary Grand Duke Guillaume and Hereditary Grand Duchess Stéphanie visited the Vatican today where they were received by Pope Francis for a private audience. Nothing further is known about the meeting with the head of the Catholic church and as of yet, there are no pictures of the visit. Well, you can no see and hear all about it in the video above. It is already the second time that the Hereditary Grand Ducal Couple officially visited the Vatican this year as they were present for the last mass celebrated by the retired Pope Benedict XVI. 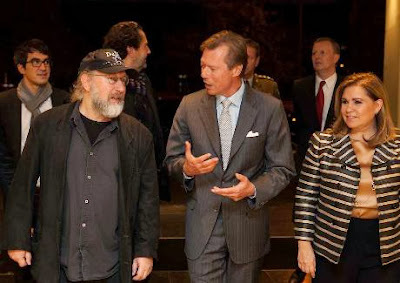 Already last Friday, the Princess Marie was in Vienna were she attended the 'A Tribute to Vienna' show by the Spanish Riding School and the Vienna Boys' Choir. The event seemed to have flown largely under the radar of the press; while I can locate two videos - neither of which show the Princess - of the event at the Winter Riding School in the Imperial Hofburg Palace, there don't seem to be any pictures of the guests whatsoever. For more information about the event itself, have a look here. 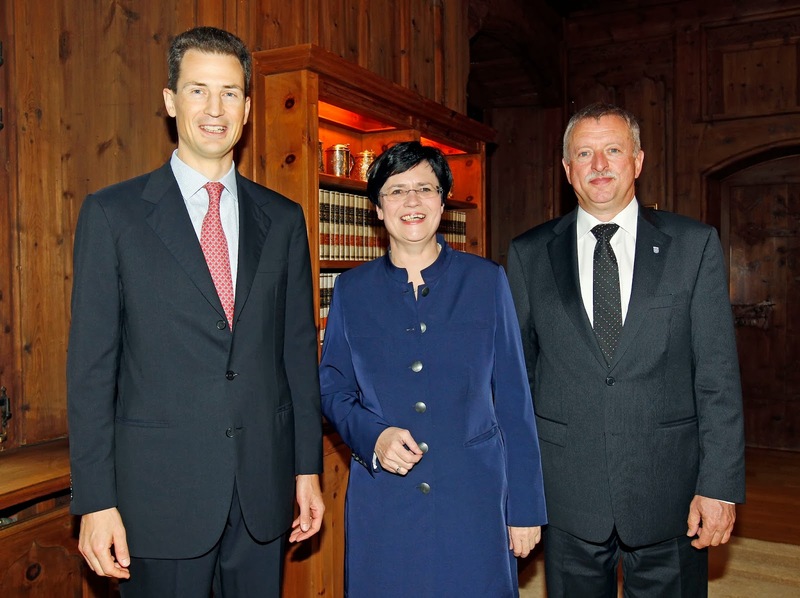 Today, the minister-president of the German state of Thuringia, Christine Lieberknecht, was on a visit to Liechtenstein. 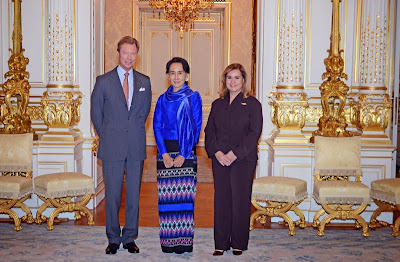 Among a bunch of other things, she and her husband were received for an audience by Hereditary Prince Alois and the trio happily posed for a picture. In addition, another one can be found at Vaterland. Also check out 1 FL TV for a video. Meanwhile, Grand Duke Henri has decided to appoint Georges Ravarani, the President of the Administrative Court, as the informateur. As explained previously, it will be the role of the informateur to find enough common ground between different parties to form a coalition. He will soon report back to the Grand Duke so that the head of state can mandante a formateur, one of the party leaders, to form a government. The last time an informateur was appointed was in 1974 which coincides with the last and only time in the post-war period that the CSV did not become a part of the coalition government. Even though the CSV holds 23 of the newly elected 60 seats of the parliament, it seems much more likely that the DP and LSAP with 13 seats each as well as the Greens (six seats) will form the new government. In less serious and thus much more uplifting news, mark you calendar as there is a dose of cuteness coming up! Prince Gabriel and Prince Noah, the sons of Prince Louis and Princess Tessy, will accompany their grandmother, Grand Duchess Maria Teresa, for an event on Friday. The trio will be attending a charity running event to raise funds for HIV/AIDS awareness and research at the Mersch branch of the Lycée classique de Diekirch. Also worthy to look forward to is Saturday as Hereditary Grand Duke Guillaume and Hereditary Grand Duchess Stéphanie will be present for a concert to mark their first wedding anniversary by the Orchestre de Chambre du Luxembourg and a few others on that day. The benefits of the concert including music by Wolfgang Amadeus Mozart, Pyotr Tchaikovsky and Felix Mendelssohn will go to the 'A hand for the sick' initiative of the Luxembourgish Red Cross. Earlier tonight, Grand Duke Henri and Grand Duchess Maria Teresa attended the premiere of the film D'Fifties at the Utopolis cinema in Luxembourg. The documentary by Andy Bausch deals with the topic of - surprise, surprise - the 50's in the Grand Duchy. During the journey through the post-war decade, a number of people tell the stories of their youth in relation to the media, tourism, industry, church, sports, rock'n'roll and more. RTL has a video of the event which includes an interview with the Grand Duke. Also seemingly today though I can't find any pictures which is quite strange, Prince Hans-Adam II and Princess Marie were out and about the unveil busts of the sovereign prince's late parents, Prince Franz Josef II and Princess Gina, by artist Bertrand Freiesleben in front of the St Florin Cathedral in Vaduz. As we already talked about the love of Liechtensteiners for busts, simply check out one of our recent post for the story's details. 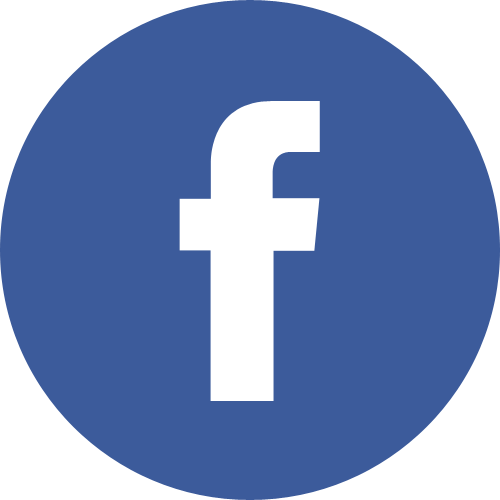 -- Update: Check Vaterland for a picture and 1 FL TV for a video which will tell you that Hereditary Prince Alois and Hereditary Princess Sophie were in attendance for the unveiling as well. Even those who are not regular followers of the Princely Family have probably heard about the topic of abortion in relation to the Principality. 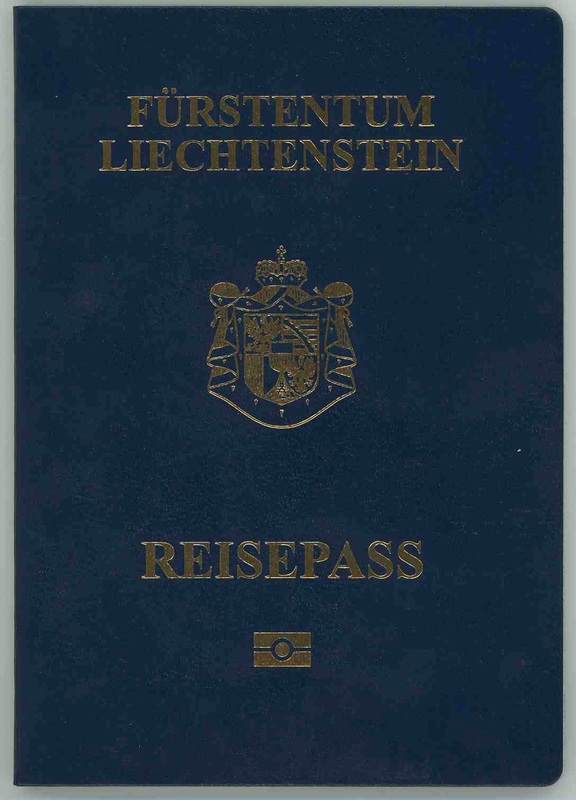 In 2011, there was a referendum in Liechtenstein to generally allow abortion within the first twelve weeks of pregnancy. Hereditary Prince Alois, who has been his father's regent since 2004, threatened to use his veto powers in case the majority would vote in favour of abortions on demand. In the end, 52.26% of voters rejected the referendum and the laws of 1987 stayed in place. The current law states that abortion is illegal and whoever performs an abortion can be punished with up to one year in prison. If an abortion is performed for profit, the sentence is elevated to three years in prison. Abortions are permitted, however, when deemed necessary to prevent serious danger to the life of the pregnant woman or serious harm to her health, when the pregnant woman is under the age of fourteen and has not at any time been married to the man who impregnated her, or when performed to save the pregnant woman from immediate danger to her life that cannot otherwise be prevented. In all those cases, the abortion must be performed by a physician. About a week ago on October 16, the FBP, the Progressive Citizens' Party in Liechtenstein of prime minister Adrian Hasler, has come forward with an initiative to decriminalise abortion which means that abortion will still not be allowed to be performed in Liechtenstein but that it will be legal for women to go abroad and perform an abortion according to the laws of the country in question. In addition, the FBP wants to change the penal code to make it a criminial offense to pressure a woman to have an abortion. Apparently, quite a number of people has since asked the press office of the Hereditary Prince what he thinks about the legislative initiative and so he has decided to answer. In a nutshell, he agrees with the initiative. Hereditary Prince Alois says that the existing law has a guideline function for the society but that a change of focus will protect mothers and unborn children even more than it is the case now. While the initiative reduces the orientation role of the law in one way, it strenghtens it in another very important way by criminalising it to pressure a woman to have an abortion which is sadly the case far too often. Instead of punishment, women shall receive help by providing them with professional, neutral and, if desired, anonymous counselling by specialists as well as quick, specific, free and lasting help to offer positive perspectives for a life with the child. In addition, child -friendly family, women and social policies shall be provided. Hereditary Prince Alois also says that more should be done in the fields of awareness and prevention work in order to avoid unwanted pregnancies. For the whole statement, have a look at the press release. On Sunday, the citizens of Luxembourg voted in the general elections and now it is up to the Grand Duke to decide who will form a new government. While prime minister Jean-Claude Juncker's Christian Democrat CSV lost voters and now has 23 seats of the 60 seat parliament, the Liberal DP gained a few seats and now ties with the Socialist LSAP for 13. The Greens took six seats and we can forget about the rest for the sake of this post. You might remember that the previous government under Mr Juncker came down after the spy scandal and the role (or non-role as he was too busy with other things to notice what was going on) Juncker played in it. Prior to the elections, the DP, LSAP and Déi Gréng promoted a possible three-party coalition and it seems as if that might be coming true as the parties already started talks last night. If the new coalition indeed comes true, Luxembourg's mayor Xavier Bettel will become the new prime minister. It will be up to the Grand Duke to mandate one of the party leaders to form a government. 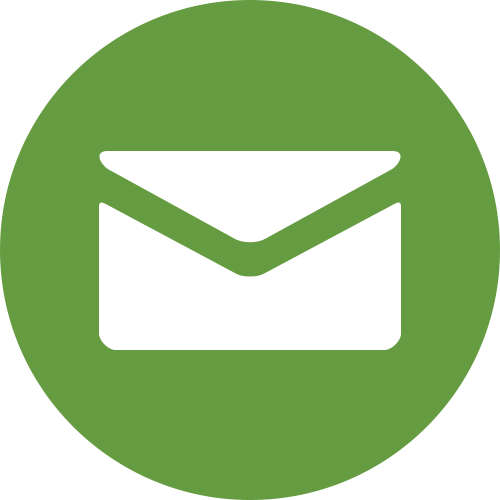 There are two ways of doing that by either by appointing a formateur or an informateur. A formateur is a politician who is chosen by the head of state to form a government. In difference, the informateur is not expected to finalise a coalition but an authorised person who shall explore the possibilities of forming a government so that the Grand Duke does not need to meddle in politics. 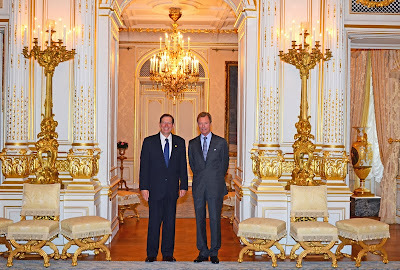 In order to decide what to do, Grand Duke Henri has been holding talks with various polticians, namely the party leaders of the CSV, LSAP, DP, Déi Gréng, Déi Lénk and ADR as well as the prime minister, the outgoing president of the Chamber of Deputies and the president of the Council of State, yesterday and today. 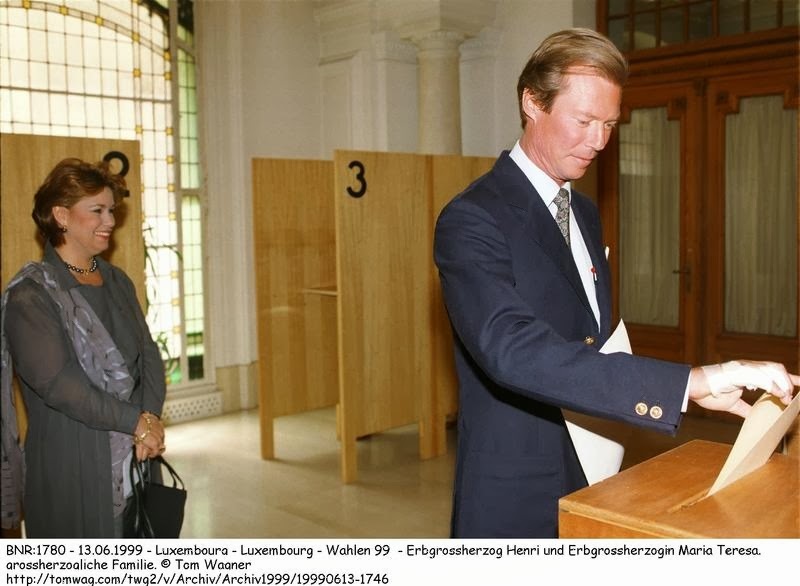 Today it is general election day and the Grand Ducal Family was out in quite a force to cast their vote -- Yes, they do. Grand Duke Jean, Hereditary Grand Duke Guillaume and Hereditary Grand Duchess Stéphanie, Prince Félix sans his German wife Princess Claire, Prince Louis and Princess Tessy, Princess Alexandra as well as Prince Sébastien were at the Ratskeller of the Cercle Cité at Place d'Armes in Luxembourg City this morning to meet their civic duties. More pictures of the Grand Ducal voters are located on Manuel Dias' website as well as at Tageblatt, Revue, Wort in German, Wort in French and Wort in English. RTL has a little sound bite from the Grand Ducal Family at the polling station - scroll down to Groussherzoglech Famill a Xavier Bettel ware wielen: N. Graf - including a few words by the Hereditary Grand Duke who said, "It's a big day for the country and we will be keenly awaiting the results tonight. It will be a new phase." I'm fairly certain that we will also get to see videos of the Family voting later today, so make sure to check back. And indeed the first one is now available at Wort, just skip ahead to 1:35 if you do not wish to view the interview with prime minister Jean-Claude Juncker. Another one can be found at RTL, once again just skip ahead to 5:15. Located in the German state of Hesse and surrounded almost entirely by the Lahn river; Weilburg an der Lahn can boast a rich history intertwined with the history of the branch of the House of Nassau by the same name which has ruled the Grand Duchy of Luxembourg since 1890. Between 1700 and 1719, Weilburg was developed into the residential city of the House of Nassau-Weilburg and even though the princely seat was moved to Kirchheim (today known as Kirchheimbolanden) in 1741, it remained the seat of government. In the early 18th century, Weilburg became residential city once again until Duke Wilhelm of Nassau made Schloss Biebrich in Wiesbaden his main residence in 1817. In today's post, we are going to have a closer look at Weilburg's most prominent feature, its castle, which belonged to the Grand Ducal Family until 1935. Long before the castle formerly owned by the Grand Ducal Family was built by Count Johann I of Nassau (between 1355 and 1359) another castle and seat of the Franco-Merovingian gentry was located on the hill above the Lahn river. Parts of the latter can still be found in the northern part of the east wing as remains of a fortified tower with round-arched frieze dating from the 14th century are preserved to this day. The Schloss Weilburg that we know today has its roots in the 16th century when already existing sites were extensively altered and expanded. While the plans started out relatively modest, a four winged castle was built within 40 years. The castle is considered to be one of (if not the) most important renaissance castles in all of Hesse. The first one to be built was the eastern wing. Realised between 1533 and 1539, Nikolaus Schickedanz constructed the eastern wing as the first modern renaissance castle in the Nassau area. Originally planned as a representative two-storey residence, the wing was increased by one storey in 1661/2. In the same period of time, the stair tower received its current size. From 1850 until 1852, changes were made to the private apartments of the Duke and Duchess located in the eastern wing and reachable via a seperate entry. Above the portal of said entry, you can find the alliance coat-of-arms of Count Philipp III of Nassau-Weilburg and his third wife, Amalie of Isenburg-Büdingen. The southern and western wings were built between 1540 and 1548 by Balthasar Wolff from Heilbronn. Together with the already existing eastern wing, the two new buildings created a three winged castles open to the north. 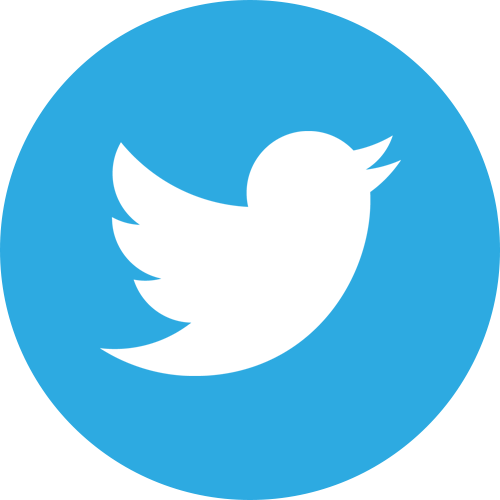 The two new wings were used diversely. While the ground floor of the southern wing was used functionally, ceremonial and representative rooms were located on the second floor. The ground level of the west wing consisted of the royal stables, a guardhouse as well as the gateway. Above those, more apartments were located. Between 1567 and 1572, a stair tower was added. Called the Stadtpfeifferturm, it got its name from the town piper who lived in an apartment in the tower. Once again, an alliance coat-of-arms can be found above the entrance, this time of Count Albrecht of Nassau-Weilburg and Anna of Nassau-Dillenburg. As the last one of the four parts of the castle, the northern wing was built between 1567 and 1573 by Ludwig Kempf and Georg Robin. The northern wing is the only one with a very regular facade including spire lights and oriels. It's most noticeable feature are the court arcades with ionic marble columns on the ground floor; the previously open arcade on the second floor was closed in 1590 and the facade received corinthian columns. Between 1580 and 1590 the Grüner Bau (green building) was added between the northern and eastern wings and remodelled during the 18th century. A special feature of the castle is a massive marble bath built between 1711 and 1713 according to plans by Julius Ludwig Rothweil with both constant hot and cold water, something that was uncommon during the time. Starting in 1703 and initiated by Count (later Prince) Johann Ernst of Nassau-Weilburg (1664-1719), the castle surroundings received a new appearance through refurbishments according to plans of Rothweil. 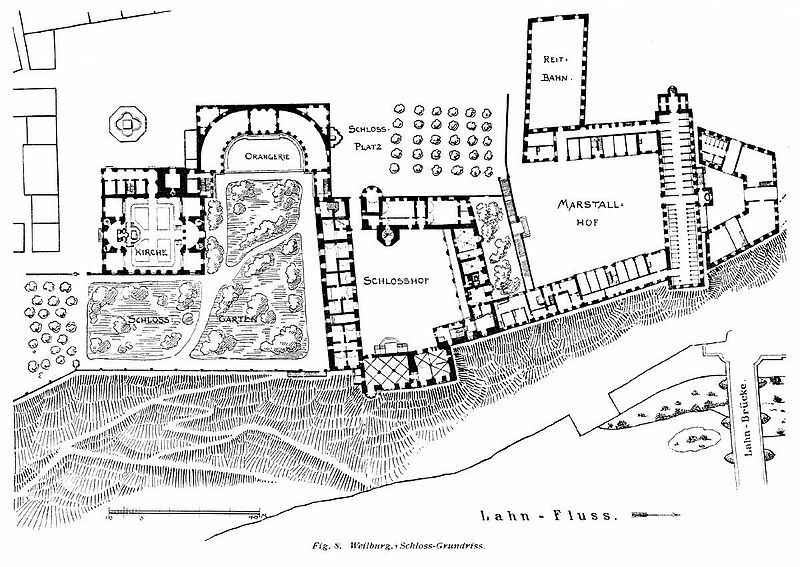 Over roughly the next eleven years, the entire townscape of Weilburg was transformed due to the construction of numerous administration and functional buildings, a castle church (1707-13) and gardens that included two orangeries. The entire complex of the castle and the surrounding town is a prime example of a small baroque residential city during the age of absolutism. Both during the 18th and 19th century, expansion plans for the castle were drawn up but never carried out. At the turn of the 19th century, another few changes were made in particular in relation to the furnishing and the fortification of the castle. The castle remained the property of the Ducal Family of Nassau, who later became the Grand Ducal Family of Luxembourg, even though they rarely spent time in Weilburg after Nassau was annexed by Prussia in 1866. It was only in 1935 that Grand Duchess Charlotte sold the castle to the Prussian state. Nevertheless, members of the Grand Ducal Family are still regularly paying visits to the castle and the town surrounding it. 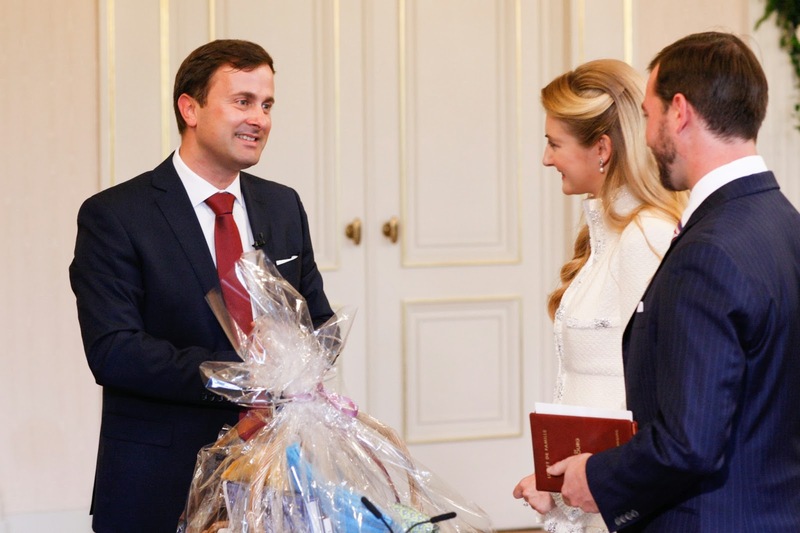 Hereditary Grand Duke Guillaume and Hereditary Grand Duchess were in Weilburg just a few weeks ago and Grand Duke Henri and Grand Duchess Maria-Teresa visited last year. Since the end of World War II, the Schloss is owned by the state of Hesse. Parts of all the four wings as well as one of the orangeries can be visited during a guided tour which takes about 45 minutes. For more information (in German), have a look on the website of the State Castles and Gardens Hesse. Sunday doesn't only mark the Hereditary Grand Duke's and Hereditary Grand Duchess' first wedding anniversary but it is also election day in Luxembourg. 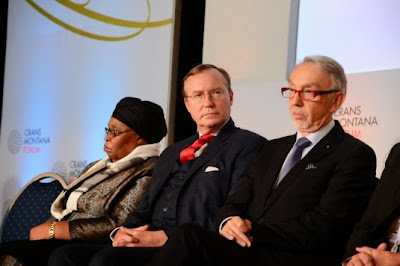 If you are a regular follower of this blog (or Luxembourg news in general), you'll likely remember that the Grand Duke agreed to new elections back in July after the country's government fell apart following the SREL scandal. Earlier this month, Grand Duke Henri dissolved the parliament and now the time has come for the inhabitants of the world's only Grand Duchy to newly elect the 60 members of the Chamber of Deputies. Among those 238,587 Luxembourgers asked to cast their vote on Sunday are members of the Grand Ducal Family. Every time this happens, there are a lot of people in the world of royal watchers who question just how the Family can do that on the basis that the Brits and a bunch of other royal families don't do it. Well, Luxembourg is Luxembourg and the Grand Ducal Family the Grand Ducal Family so they can decide for themselves and this year is no different than any previous years. The cour grand-ducale has announced that Grand Duke Jean, Hereditary Grand Duke Guillaume, Hereditary Grand Duchess Stéphanie, Prince Félix, Prince Louis, Princess Tessy, Princess Alexandra and Prince Sébastien will all be casting their votes at the Ratskeller polling station in Luxembourg City. I'm sure that all the other members of the Family who are citizens of the Grand Duchy will also be voting on Sunday as voting is compulsory for voters on the electoral registers in Luxembourg and we have seen most of them meeting their civic duties in the past. Any Luxembourg citizen who satisfies the legal conditions is entitled to participate in the elections. These legal conditions include being a citizen of Luxembourg, above the age of 18 and to be in possession of one's civic and political rights, which means to never have been convicted of a criminal offence. As the named members of the Grand Ducal Family fulfil all these conditions, there is no law preventing them to vote and so everyone apart from the Grand Duke and the Grand Duchess does. 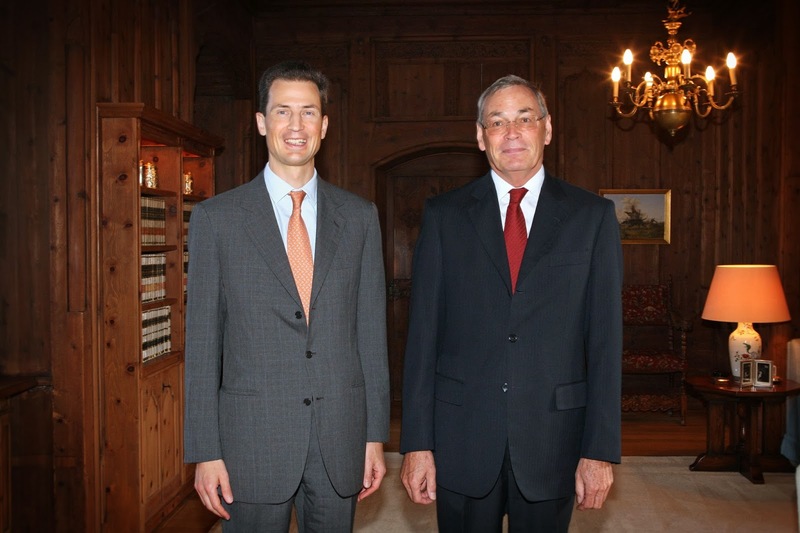 The Grand Duke is required by the Luxembourgish constitution to remain neutral and above politics. 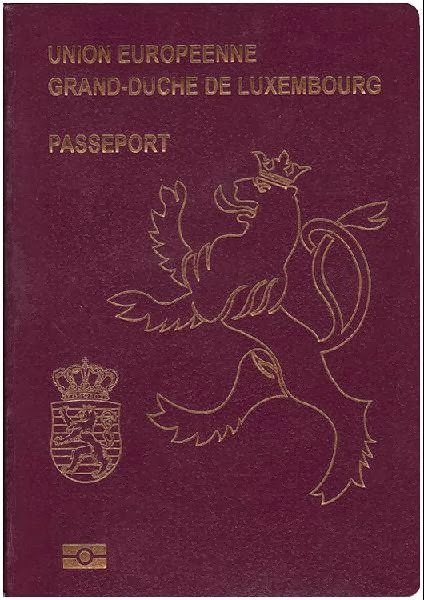 According to legal scholar Luc Heuschling, the city of Luxembourg claims that neither the Grand Duke nor the Grand Duchess possess voting rights though there is no legal basis for this claim regarding the Grand Duchess. In most other European monarchies, royals (in contrast to the monarch and sometimes even them) actually have the right to vote but chose not to do so because it would otherwise damage the impartial image of the royal family though I must admit that I personally don't quite get the logic behind that. Thankfully, the elections in mentioned European monarchies are are both secret and anonymous so simply showing up at a polling station and secretly and anonymously casting your vote doesn't damage that image of neutrality, at least in my humble opinion and the Grand Ducal Family seems to agree with me. Their understanding originates with Grand Duchess Charlotte who already said in 1919 that she did not want to be separated from her people and share their every joy and suffering. It wasn't until 1945, however, that all members of the Family apart from Grand Duchess Charlotte herself were inscribed into the electoral register. She remained off the list even after she abdicated though both Grand Duke Jean and Grand Duchess Joséphine-Charlotte regained their voting rights after his abdication in 2000. That same year, Grand Duke Henri and Grand Duchess Maria Teresa were scratched off the list. In a similar light, Grand Duke Henri has the habit of addressing his subjects as "dear fellow citizens" showing that he considers himself to be the first citizen of the country. 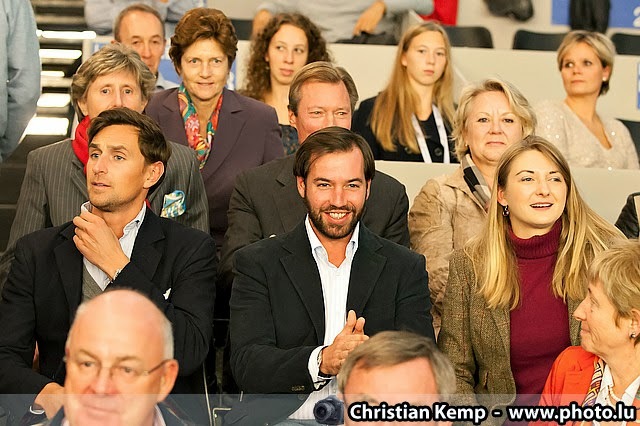 Well, not all of them but nonetheless... Grand Duke Henri, Hereditary Grand Duke Guillaume and Hereditary Grand Duchess Stéphanie were at the Kockelscheuer last night to watch the evening match of the BGL BNP Paribas Luxembourg Open taking place this week in - you guessed it - the Grand Duchy. Also among the audience was Lawrence Frankopan, good friend of the Hereditary Grand Duke and sports agent. Sadly for our Luxembourgish tennis fans local Mandy Minella lost in two sets against former World No. 1 Caroline Wozniacki from Denmark in two sets (3:6, 6:7 (2:7)). Nevertheless, check out Christian Kemp's website to see a few more visuals of the Grand Ducal cheering squad. Also have a look at RTL's pictures and video including a short glimpse of the Grand Ducal tennis fans. After Grand Duke Henri had received the president of Miami University early this morning, it was the Grand Duchess' time for an audience. Shortly before noon, Grand Duchess Maria Teresa welcomed Siddharta Kaul, president of SOS-Kinderdorf-International, Marjolijne Frieden, president of the Luxembourgish branch of SOS-Kinderdorf-International, and Sophie Molitor, director of the Luxembourgish branch of SOS-Kinderdorf-International, at the palais. Having its origins in Austria under the name SOS-Kinderdorf, SOS Children's Villages is an independent, non-governmental international development organisation which has been working to meet the needs and protect the interests and rights of children since 1949. Its international umbrella organisation, SOS-Kinderdorf International, was founded in 1960, after national associations had been established in France, Germany and Italy in addition to the original Austrian one. The Grand Duchess is the patron of the Luxembourgish SOS-Kinderdorf association. By far the biggest story of the day is that of Hartmut Lademacher, Princess Claire's father, and his Croatian castle. 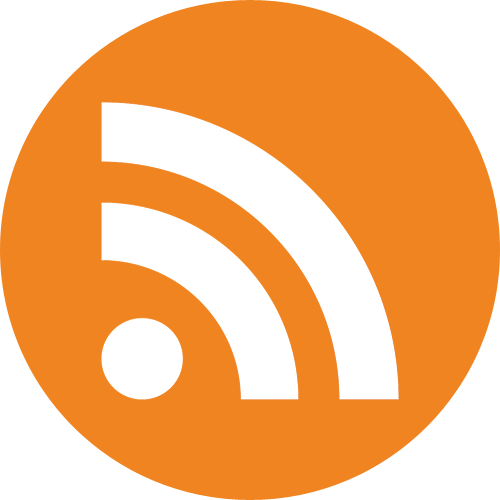 According to information of the German press agency DPA and reprinted by almost all of Luxembourg's newspapers (Wort, Tageblatt, L'essentiel, etc.) 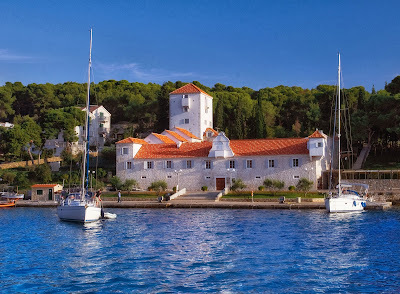 Mr Lademacher purchased a dilapidated castle and some other lands on the island of Šolta about ten years ago. He restored and transformed the castle into a hotel. He also heavily invested into the whole island making it a tourist attraction which attracts about 20,000 people per year now. When all the work was completed, the state's forestry department claimed that the land was in its possession and that the local commune never had the authority to sell the land to Lademacher in the first place. While a local court recently ruled against a complaint by Lademacher, there is still hope for him as new laws came into effect earlier this year stating that a foreign buyer is allowed to keep land that he bought “in good faith” from a state institution. The father of Princess Claire isn't the only foreign investor who has had such troubles in Croatia during the last few years. Turning to Belgium and not really headline-making news, Archduke Carl-Christian of Austria, husband of Princess Marie-Astrid, participated in the 2nd European Encounters "of active young Christians implicated in professional, family and associative life wishing to articulate the faith of their heart". The event took place in Brussels over the weekend and on Saturday morning, Archduke Carl-Christian gave a speech entitled "Culture – Blessed Charles of Austria, builder of the civilisation of love". Probably sometime over the weekend, Princess Marie welcomed 16 children from the county of Maramureş in Romania at Schloss Vaduz. The children from disadvantaged families are currently on holiday in Liechtenstein thanks to the help of the Liechtenstein Red Cross that the Princess is president of. If you'd like to know more, check out these two ghetto-translated Romanian articles in the hope that you can make more sense of them than I. At times, at least. 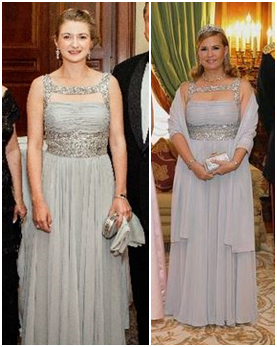 When Hereditary Grand Duchess Stéphanie stepped out in a gown previously worn by her mother-in-law Grand Duchess Maria Teresa for a New York event earlier this year, it revived an old topic when it comes to the Grand Ducal Family of Luxembourg, clothes sharing between various members of the family. We have talked about this before and as the post continues to be a popular one, I thought we'd do so again. Let's start by having a look at Luxembourg's queen of recycling that is Princess Marie-Astrid, or Archduchess Marie-Astrid if you like. 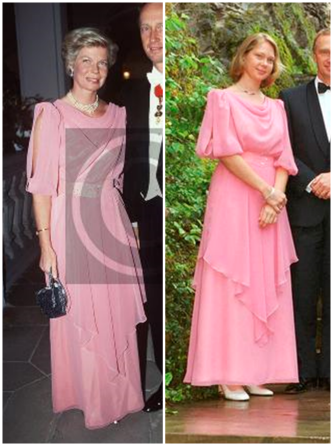 One of her most frequently worn dresses is actually a gown once owned by her late mother, Grand Duchess Joséphine-Charlotte, who wore it for an official portrait during the early 1990's. 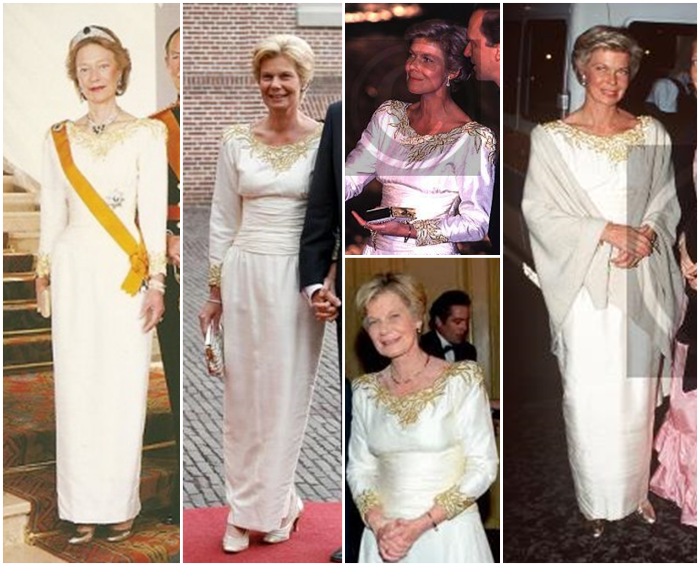 Princess Marie-Astrid got her hands on the dress sometime during the later half of the decade as she wore it for at least two events at that time before reusing it for the 40th birthday celebrations of King Willem-Alexander of the Netherlands in 2007 and for the joined birthday ball of Princess Maria Galitzine and Nina Peers de Nieuwbergh last year. I'm pretty sure those aren't the only times she sported this white and gold number. While we will primarily focus on the clothes sharing part in today's post - cause let's face it, we all recycle clothes on a daily basis - this one is still worth sharing. While mere mortals would probably spent a few (more) bucks to get themselves new clothes for their children's wedding, Princess Marie-Astrid seem to prefer to recycle old ones for those occasions. While we already talked about her attire for Archduchess Marie-Christine and Archduke Christoph's respective weddings the last time Luxarazzi went fashion, we recently discovered that the outfit from Archduke Imre's wedding is a repeat from the christening of Prince Léopold and Princess Charlotte, twin children of Prince Guillaume and Princess Sibilla. 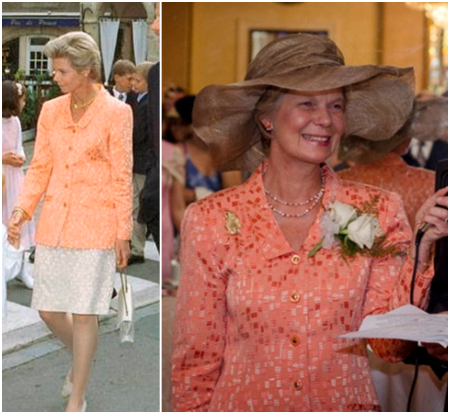 But Princess Marie-Astrid doesn't only like to recycle her own clothes or to wear out her mother's as she also seems to believe in sharing with her own daughter. In fact, Archduchess Marie-Christine wore one of her mother's dresses for the official 18th birthday celebrations of her cousin Hereditary Grand Duke Guillaume in 2000. 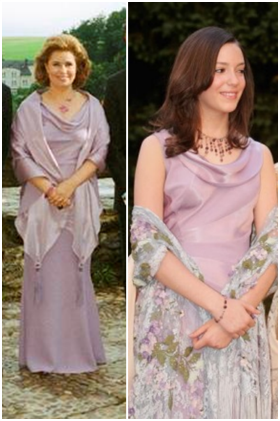 Meanwhile the dress worn by Grand Duchess Maria Teresa on that night at the Château de Vianden reappeared a few years later on her only daughter Princess Alexandra, who wore it with a different scarf at her parents silver wedding anniversary celebrations in 2006. Some of the outfits even make rounds on more than two ladies of the Grand Ducal Family. The blush pink dress worn by Princess Alexandra and Princess Tessy during recent years seems to be the same one as worn by Grand Duchess Maria Teresa at the wedding of Crown Prince Haakon and Crown Princess Mette-Marit of Norway in 2001. But Grand Duchess Maria-Teresa does not only seem to share her clothes with her daughter and daughters-in-law but also her sister-in-law Princess Margaretha. While this (presumably) Natan number was first worn by the Grand Duchess during a state visit to Slovakia in 2005, it later appeared on Princess Margaretha when her son trooped the colour in London. After watching Grand Duchess Maria-Teresa's dressing habits for a few years now, I can tell you that she wears most of her outfits for two or three publicised events before retiring them to private life, just as it is the case for many European royal ladies. 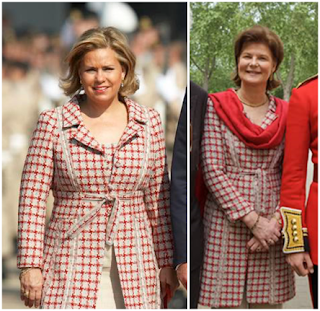 I presume that a similar pattern could have been found for Grand Duchess Joséphine-Charlotte back in the day. Now, all of these clothes are expensive and well-made, so I don't think it is out of question that the Grand Duchess (or other royal ladies for that matter -- check out Order of Splendor to see who actually does so) calls her family and friends to ask whether they'd like a dress, a suit or something else out of her closet before emptying it out. As for Liechtenstein? I don't know. Apart from Princess Maria-Anunciata rummaging in a certain aunt's wardrobe and Princess Isabelle's overrepeated 90's gowns (thumbs up for still fitting into them 20 or so years later though), I simply haven't been following them long enough to see such patterns. Another thing I noticed though: Do you get a discount if you buy two or more of the same dresses in different colours? Today is Luxembourg's national day of commemoration which takes place every year on the Sunday closest to October 10. On that day in 1941, the German occupiers took a survey of Luxembourgish civilians who were asked about their nationality, mother tongue and racial group expecting them to answer all those question with 'German' but contrary to expectations, about 95% of those asked filled 'Luxembourgish' into the gaps. The refusal to declare themselves as German citizens led to mass arrests among the population. To mark the day, masses and wreath laying ceremonies take place all over the country. 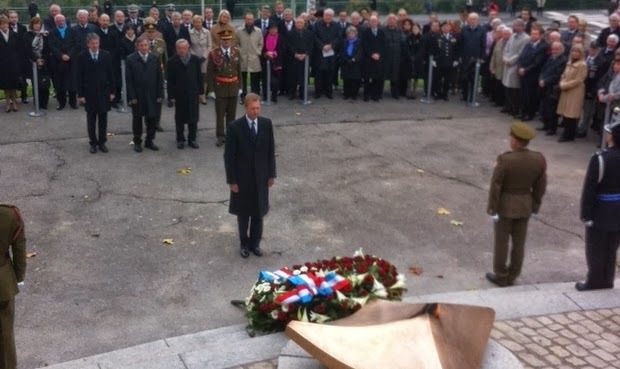 Grand Duke Henri particpated in a religious service held the at the Cathédrale Notre-Dame and afterwards laid a wreath at the Monument vun der nationaler Solidaritéit on the Kanounenhiwwel where he also relit the eternal flame before visiting the insides of the memorial. Tageblatt has a gallery of pictures of the day, as does the cour grand-ducale. Meanwhile RTL a video. This morning, the Grand Duke did not have one but two dates in his calendar for one of which he was accompanied by his wife, the Grand Duchess. At first Luxembourg's head of state attended the opening of the annual autumn fair, a trade show dedicated to the construction, renovation, decoration and design with more than 400 exhibitors, at the LuxExpo in Kirchberg. 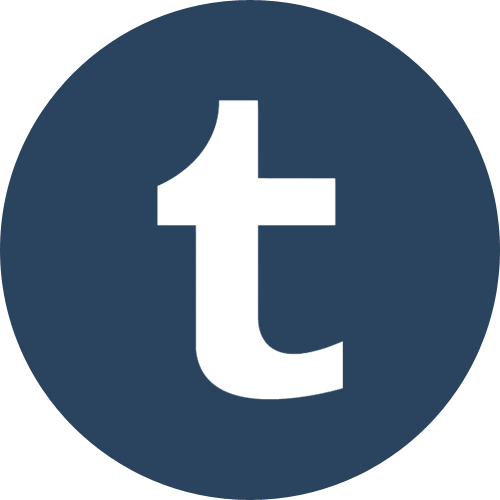 For a few visuals, have a look at Wort in German and Tageblatt. Just one and a half hours later, Grand Duke Henri and Grand Duchess Maria-Teresa participated in an academic session to celebrate the 10th anniversary of the University of Luxembourg at the Cercle Cité. Once again, Wort in German offers a gallery of visuals of the event. 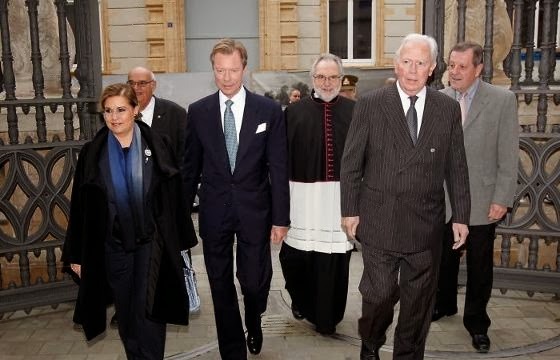 Last night, Grand Duke Henri and Grand Duchess Maria-Teresa attended a a service to mark the 150th anniversary of the Union Grand-Duc Adolphe (UGDA) at the Cathédrale Notre-Dame which included a concert by the British choir Wells Cathedral School Choralia. The UGDA is the umbrella organisation for all kinds of musical groups in Luxembourg such as choral societies, brass bands, music schools, theatrical societies, folklore associations and instrumental groups and has over 17,000 individual members. Founded as the Allgemeiner Luxemburger Musikverein (ALM) on September 6, 1863, it is known as the birthplace of Luxembourg's national anthem which was firstly played during one of their concerts. After its decline during the 1880's, the ALM was revived as the Adolph-Verband on March 31, 1891 and placed under the high patronage of Grand Duke Adolph. In 1919 the name was changed from German to French and the organisation became known as Union Adolphe and, in 1947, Union Grand-Duc Adolphe. For more pictures of yesterday's concert, have a look at Wort in English.